Inspector Neame finished reading the reports of the previous night’s events, squared the papers and placed them neatly upon the corner of his desk. He removed his pince-nez and regarded his assembled officers over steepled fingers. 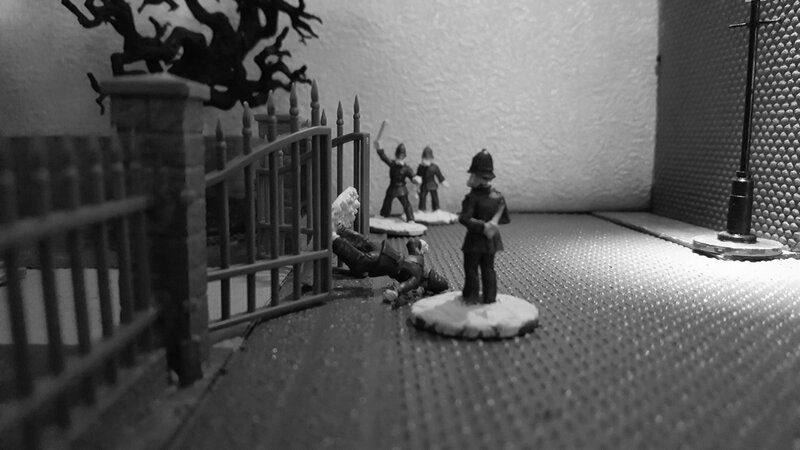 There was a murmur of concern from his men, with Sergeant Webb looking particularly distressed. This revelation caused a sharp intake of breath from the assembled officers, although Constable Moore appeared to have something else on his mind, judging from his expression. Moore had a reputation for exacting attention to detail, worrying at the minutia of a case like a terrier at a rat. If something was troubling Moore, Neame wanted to know what it was. “You have a question, Constable Moore?” The inspector asked. Neame pursed his lips in thought and looked back and forth between the two reports. Moore had a point. Inspector Neame leant forward. “This state of affairs cannot continue. I want this woman apprehended and in custody before the day is out. To that end, I shall be sending you out in force this evening. 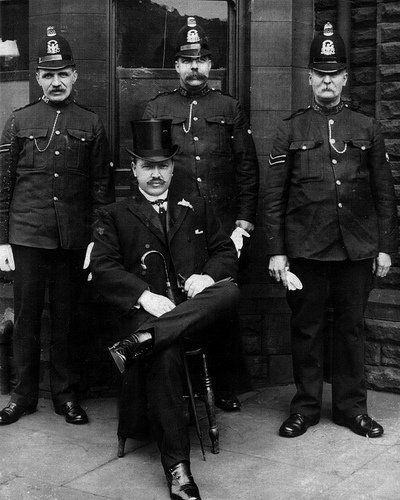 Now, I appreciate that we are a man down, with Constable Rowan currently indisposed, which is why I have requested the services of Mr. Grimm here…” He gestured to the man who had been sitting quietly in the corner of the room, a Gladstone bag at his feet, so silent that the officers had not even registered his presence. Lancelot Grimm rose from his chair, taking his bag and placing it on the desk. He unsnapped the catch and drew forth three truncheons, which he silently handed to each officer. Moore hefted the truncheon, a thoughtful expression on his face. “Does this mean…?” He began. 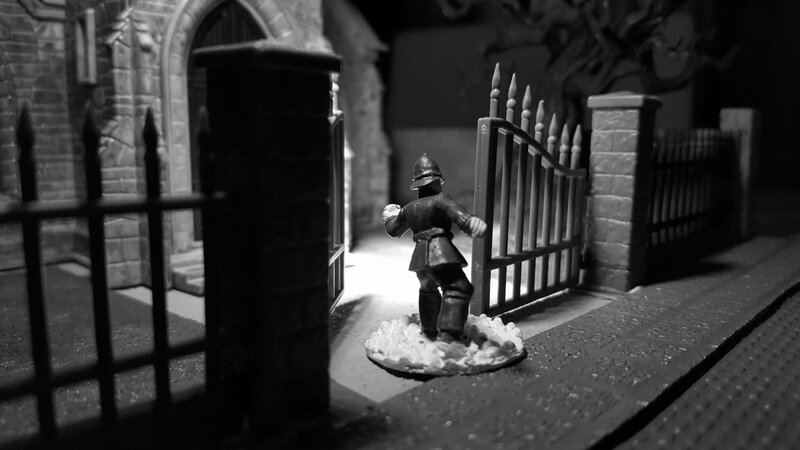 Sergeant Webb opened the door of The Red Lion and was greeted by the clammy embrace of the ever-present fog. He shivered involuntarily and contemplated whether it would be prudent to remain for one more drink, before venturing back onto the murky streets. “Oi, Webb!”, called the landlord, “Shut the bloody door!” Sergeant Webb turned and gave the landlord the eye. “I’ve got my eye on you, John Sutton.” He growled. “More like you’ve got your eye on another glass of porter, you old reprobate!” answered the landlord, amongst peals of laughter from the other patrons. John Sutton rolled his eyes. Getting Sergeant Webb to cough up what was owed was more difficult than getting a thrup’ny upright for less than the advertised rate. Still, his patronage did prevent the less savoury sorts from causing any trouble on his premises. Webb stepped out into the night, firmly closing the door behind him. Other than the muted hum of conversation from the pub and the faint creaking and hoofbeats of a lone hansom purveying late night revellers home to their beds, the streets were quiet. Best see where young Stanley’s got to, thought Sergeant Webb, no doubt he’s found some obscure inscription on a random piece of statuary and is a-busy scribbling some notes. 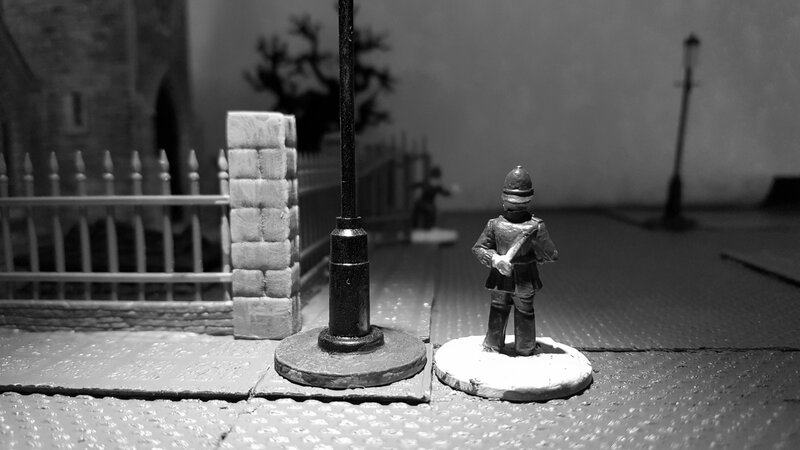 Webb stepped out onto the cobbles and made his way towards the lamp post where he had parted company with Constable Rowan earlier that night. As he drew closer to the railing surrounding St. Gilbert’s, his eye was drawn to a vague form stumbling about in the grounds, lamplight flickering spasmodically as though held in a palsied hand. Instincts honed from many years patrolling the streets had him reaching for his truncheon and whistle without conscious thought and he advanced cautiously, his whistle poised for immediate use. The shadowy figure lurched towards the gates, knocking them open with a squeal of tortured metal, and Constable Rowan staggered into view, managing a few faltering steps before dropping to his knees, his regulation lamp dropping from nerveless fingers to spin away across the ground. “Stanley!” Cried Sergeant Webb, rushing forward, all thoughts of summoning assistance banished by his overwhelming concern for his young colleague. Webb knelt swiftly by the younger man, practiced eyes running over his body, searching for evidence of assault. Rowan seemed dazed, his features pale, but his collar and cuffs were still fastened, which suggested that no Night-stalker had caused this condition. They usually went for the wrists or throat, where the arteries were closer to the surface, although the silvered thread woven into the Black Museum’s uniforms provided an effective deterrence against assaults of this kind. Webb grabbed for Rowan’s discarded lantern and shone the light into his face. The young man’s eyes were unfocussed, staring at God knew what, and what was that livid mark upon his cheek? As Webb tried to get a closer look, the mark began to fade from view, until it vanished completely, leaving Rowan’s face unblemished. “The brass walls…the circled star…so lonely, for SO long…” whispered Rowan. Webb stood quickly, raised his whistle to his lips and gave three piercing blasts. Constables Nash and Moore were also patrolling Blackwell that evening and this summons would bring them running as soon as they were able. 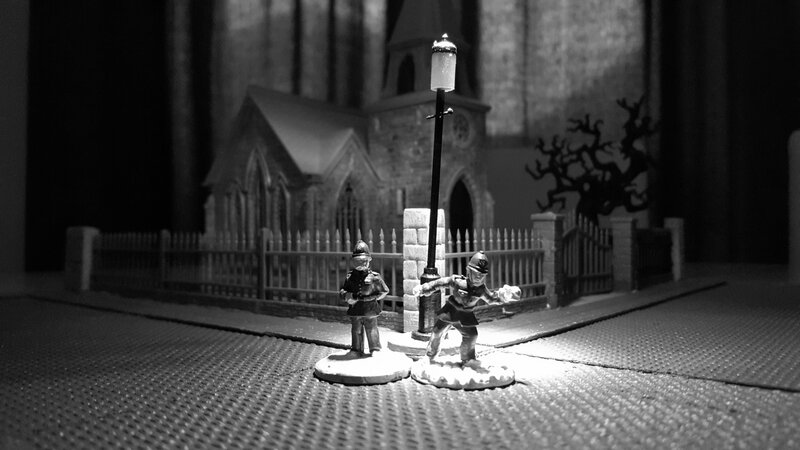 Webb cast the light form Rowan’s lamp into the shadowed confines of the churchyard, seeking answers or at least the felon responsible for poor Stanley’s attack, but to no avail. Anxiously he stood guard over the slumped form of his junior officer, his tension only easing as he heard the pounding of regulation issue boots heralding the arrival of reinforcements. As Nash and Moore appeared from the billowing fog, concern evident upon their faces, Webb found his thoughts returning to the strange mark he had thought he had seen on Stanley’s cheek. Having seen A Study in Grey posted earlier today, you could be forgiven for thinking that was this week’s post. That was, in DVD terms, ‘bonus content’. This is the actual post for this week. Now, in The Blue Lamp, I introduced a particularly important location in the fictional London borough of Blackwell, namely The Red Lion public house, chosen watering hole of the estimable Sergeant Webb and renowned for its delicious home-made meat pies, guaranteed to not contain anyone you know. At least, this is what it looked like before it closed down. I felt that it looked suitably Victorian in style and would make a good model on which to base my fictional pub. 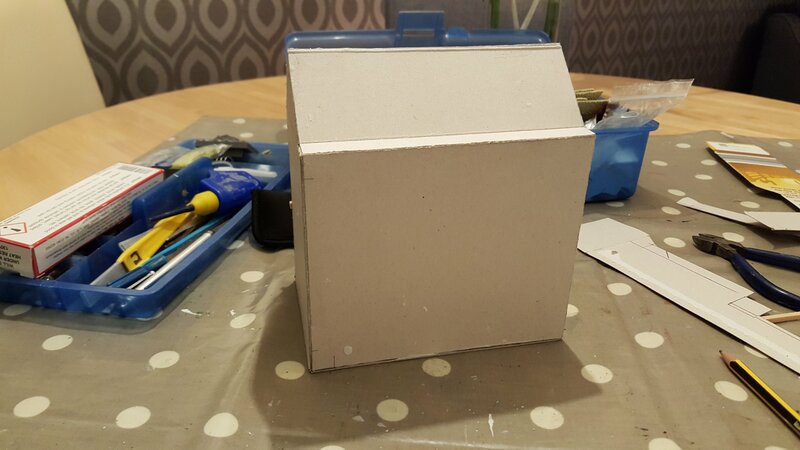 Now, as I was concentrating on building the detail up on my blank building structure, I didn’t actually take many Work in Progress pictures, so what I intend on doing is showing you the front and rear of the building, prior to painting, and explain what I used to make it. So, the front of the pub was coated with textured wallpaper, the same stuff I used as my ‘grass’ for the Chapel of St. Gilbert (see For Whom the Bell Tolls). The idea behind this was this will represent the plastered front wall. 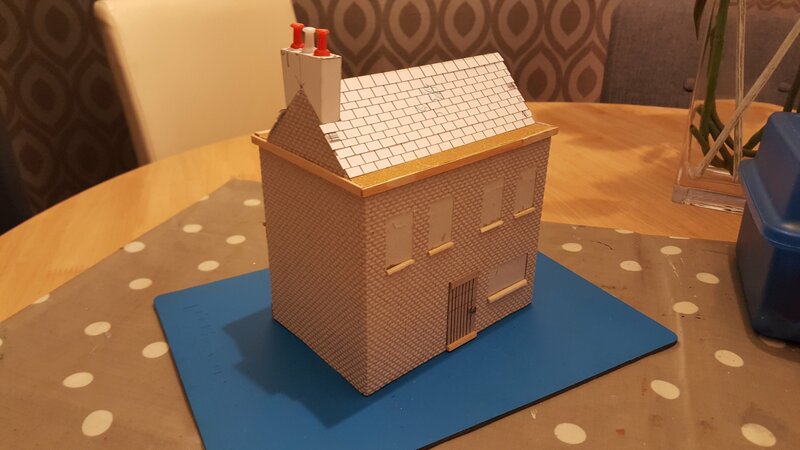 Prior to gluing this to the front of the pub, I cut out rectangles where I intended to have the door and windows. Matchsticks of various sizes were then cut and glued into place as window sills and the front step. 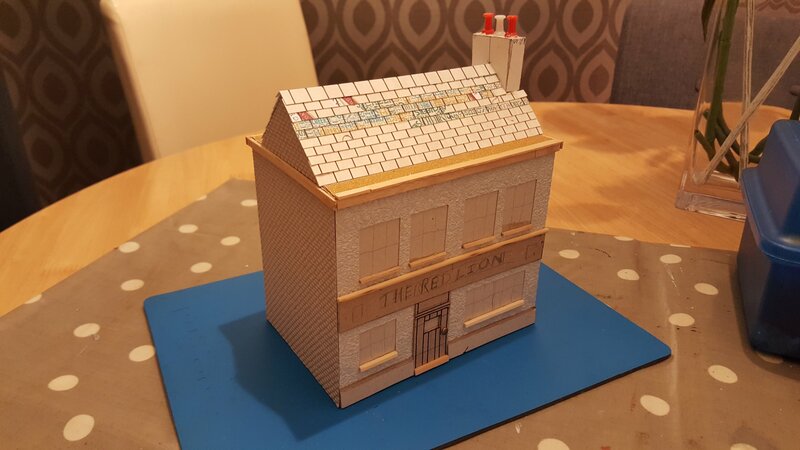 2mm brown card, similar to Greyboard, was used to create the sign and the first layer of front wall’s base, which then had another layer of cereal packet card glued on top, to create the ‘lip’ you see on these kind of buildings. A cut down bamboo skewer was glued midway down the front to represent decorative moulding and cut down coffee stirrers were glued at the top of the wall to represent the soffit. Both the front and rear roof ledges were covered with strips of sandpaper, as flat roof ledges on these sort of buildings do tend to be filled with gravel ( for drainage, I’d guess). The roof tiles themselves were made from an old greetings card, suitable scored, then cut into strips and glued in place, saving the crease of the card for the roof ridge. The chimney was a carefully measured box made from cereal packet card, with three push pins…um…pushed in and glued into place. The front door was a suitably sized and score piece of ‘Brownboard’, with a panel cut out for the window, and a picture pin with a rather nice swirly head used as a doorknob. Not a great deal of variation here – the textured wallpaper used on the sides and rear wall is one continuous piece, as the pattern looks remarkably like brickwork and I wanted to have the building look like it was built, rather than made from individual panels. The rear door has no window, but does have a lintel, created using a small strip of card. The rear wall to the left of the back door was left intentionally blank, as I may build a wooden cellar hatch to place up against this wall. So, once it’s been given an undercoat of grey primer, I can paint it up in the appropriate colours, adding the window details and signage as I go. I am considering whether I should try and construct some gas lamps to attach to either end of the sign, but will definitely be printing out, resizing and pasting some suitable Victorian handbills and music hall posters to the blank side wall…maybe for Li H’sen Chang – Master of Magic and Mesmerism or Colonel Brewster’s Wild West Show? Sir Byron Carpenter eased his vast bulk into the leather-upholstered armchair and considered the men assembled in his study through heavily-lidded eyes. They were a disreputable looking group, their patched and threadbare clothing hinting at an existence far removed from the opulence that currently surrounded them. Yet, rather than appearing ill-at-ease, an aura of menace, of barely restrained violence, could be discerned by those sensitive to such things. However, Sir Byron was unconcerned for his safety amongst this band of ruffians, for though he appeared to be nothing more than a corpulent gentleman of means, this carefully cultivated facade concealed something far more dangerous and deadly than a mere handful of street-hardened bravos. Normally, he would have assigned a task of this nature to his own people, but these man had something they lacked – local knowledge. Whilst his ‘business enterprises’ had spread like an insidious disease through most of the seedier areas of London, Blackwell had yet to succumb to his raddled touch. And that was where she had gone to ground. He ground his teeth and inwardly seethed. After all his careful planning, the pressure applied to those in positions of power, the bribes, the threats and the expense, to have her slip though his fingers and vanish into the night was near intolerable. He would have taken his frustrations out upon the man assigned as her jailor, but whatever power she had used upon him had fractured his mind beyond all repair and no amount of physical punishment could now penetrate the labrythine twists of his insanity. And just what could HE accomplish with such powers at his command? His breath grew short with excitement, as he imagined the entire city under his control. But why stop with just one city? If the legends were to be believed, and he had no reason to doubt them, once she was bound to him, nothing would be beyond his grasp. He now had the artefact…he just needed the girl. The fog was thick in Blackwell that evening, but did not seem to impede the two men as they approached the sputtering gas lamp on the corner. As they drew closer to the warm circle of light spilling from the mantle, it revealed the blue serge and silver buttons of two members of the Metropolitan Police Force. The elder of the pair, sergeant’s stripes evident upon his sleeve, paused beneath the lamp post and reached for his pocket watch, flipping the cover and angling the face so he could discern the hour. “It’s just shy of eleven o’clock, Constable Rowan.” He said. “And all’s well, Sarge?” queried the younger officer. “That remains to be seen , Constable…” Sergeant Webb glanced about the empty streets, their details obscured by the all-enveloping fog. “Remind me of the purpose of our evening’s constitutional, Constable,” he said. Constable Rowan, paused, licking his lips. “Very witty, Sarge.” said Constable Rowan. Sergeant Webb looked up at the looming bulk of St. Gilbert’s, its spire pointing heavenwards like an admonishing finger, then felt his gaze being drawn inexorably to the lambent light spilling from the The Red Lion public house, just across the road. His eyes narrowed speculatively and, reaching a decision, he turned to his young subordinate. 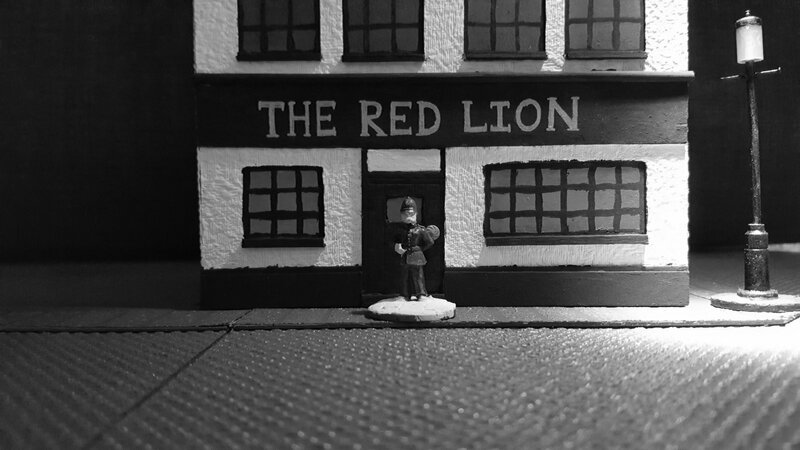 Constable Rowan sighed heavily as he watched the Sergeant stride purposefully across the street, to be greeted by a brief blast of light and laughter, before The Red Lion welcomed him into its warm and malty embrace. Silence once more reigned in the streets of Blackwell. Well, not quite silence, as Rowan was certain he could hear, very faintly, the sound of sobbing. Opening the cover of his regulation issue lamp, he cast about until he could pinpoint where he believed the sound was coming from – beyond the railings surrounding St. Gilbert’s, somewhere within its grounds. He approached the gates and cautiously pushed one open, wincing as the creak of un-oiled hinges echoed in the still night air. Stepping forward into the churchyard, Rowan cast his lamp about, trying to discern if the sobbing was still occurring or whether his entry to the grounds had stilled it. Furtive movement near the gnarled Oak drew his eye and he shone his lamp in that direction, taken out his whistle in his free hand, just in case. There appeared to be someone or something hiding in the darkest shadows cast by both the brooding Oak and the moss covered wall. Rowan approached cautiously, trying to catch the figure in the beam of his lamp. 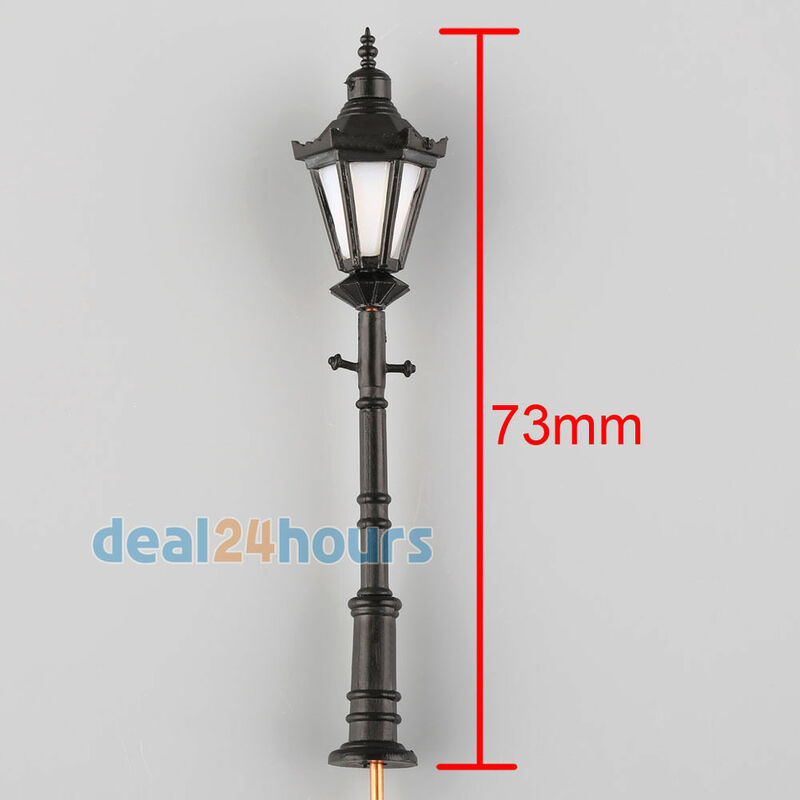 He edged nervously forward, the light from his lamp preceding him across the ground, until it caught the now still feet of the figure standing in the shadows. And in that moment, he was lost. Welcome back to the next instalment in my ongoing ‘Gothic Victoriana’ project! Currently available on eBay from here. Now, I know theses are designed for model train networks and do have an LED built-in, so they can light up, but from an aesthetic point of view, I think the gas mantle at the top is too big. But that’s a personal opinion, if you like the look of them, they work out at approximately 75p each including shipping. 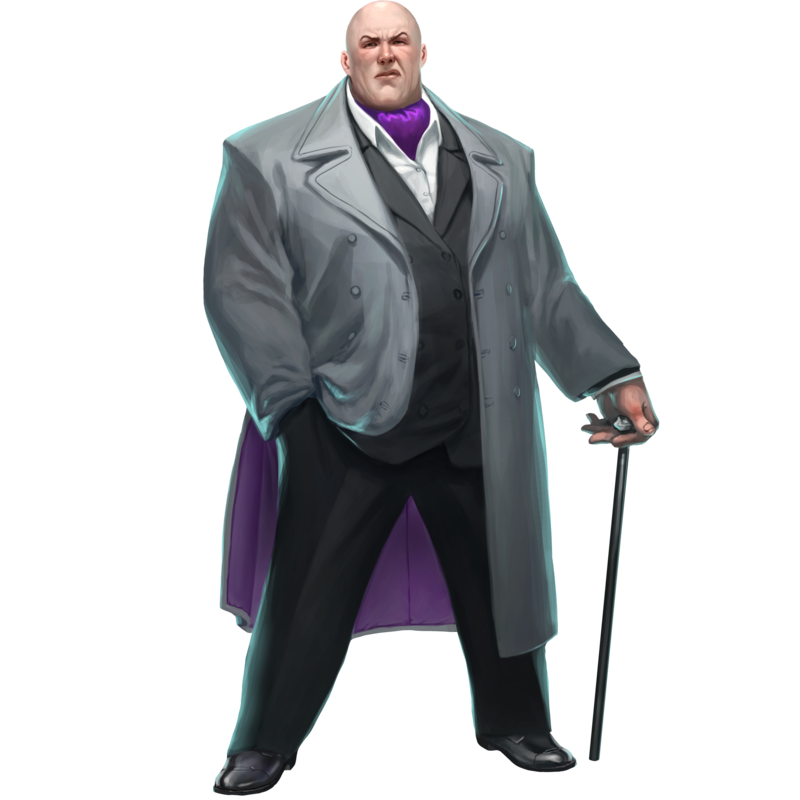 “The London district of Blackwell, although not as infamous as St. Giles, Limehouse or Whitechapel, does have an unsavoury reputation. The streets are not safe, for not only do the criminal element prey upon its populace, it also seems to attract those predators of a more…unnatural nature. However, all who reside in Blackwell know that there is one place that is considered inviolate, a sanctuary against the darkness, and that is the Chapel of St. Gilbert. As discussed in ‘Let Me Take You By the Hand…’, whilst I had created three of my four tiles for my small slice of London, I still needed a fourth. I could have created another cobbled road tile, but decided I needed something a little…different. 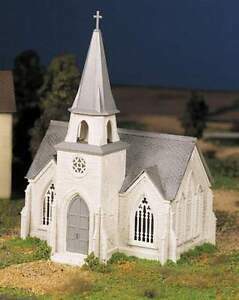 Not exactly what I’d describe as a ‘cathedral’, but given its size, it would make a good village church or small chapel. I also had a plastic ‘tomb’ from the HeroQuest game and some assembled Games Workshop plastic trees from their woodland terrain set, which keeps changing its name, depending upon which edition of Warhammer is ‘current’. Look at all these disparate elements, it seemed fairly obvious that my final tile would be a churchyard with chapel, railings and tomb, so having done a few preliminary sketches, I began work. First stage was to flip one of my Poundland self-adhesive 12″ floor tiles and remove the backing paper. Then, using my assembled chapel as a template, I cut out a ‘T’ shape from the mosaic textured wallpaper I had left over from doing the pavements on my cobbled road tiles, to form the path and ‘foundation’ of the chapel. This was centred in the tile. 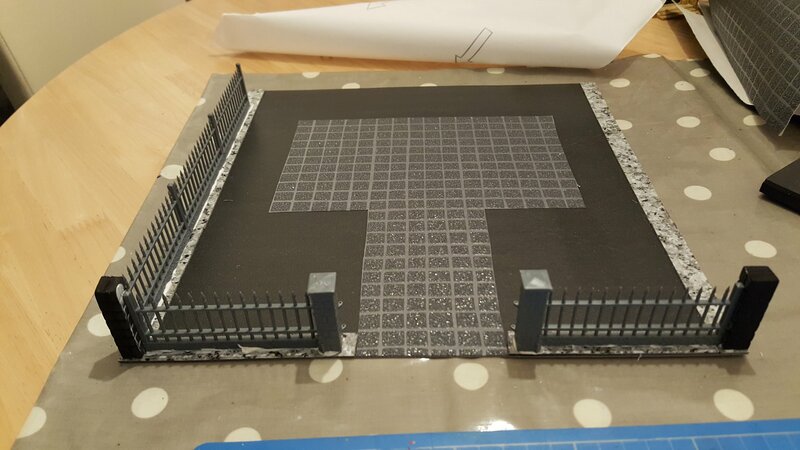 Now, a couple of things regarding this; firstly, the gate columns are designed so that the railing are supposed to come out of the corners of the columns and have moulded parts on the column opposite the hinges that you’re supposed to attach the railings to. However, I didn’t like this set up, so decided to have my railing running from the centre of the side of the column. This has the added advantages of taking up less space and puts the hinges at back of the column, rather than in the middle. Secondly, the width of the gates, their columns and a railing each side was a little short of 12″. Rather than cut down another railing to fit this gap, I decided to make some brick columns from some rubbery dense packing foam, which I had in my bits box. This stuff is lightweight and pretty dense, but takes surface detail well, so two columns were cut to size and brickwork inscribed with a ballpoint pen. 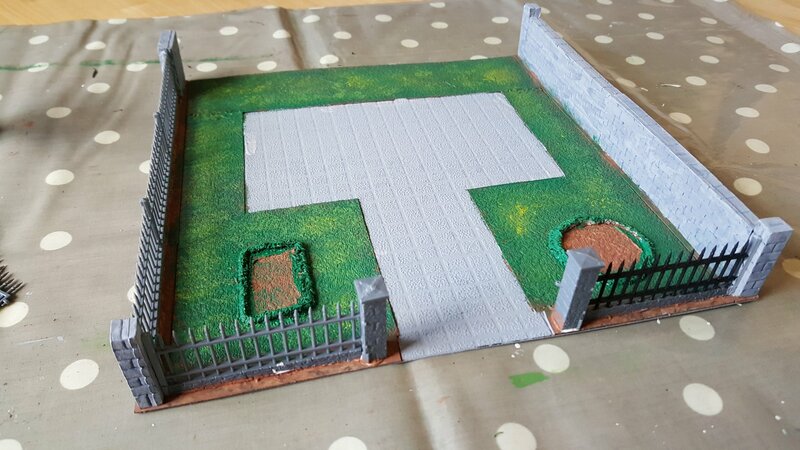 The next stage was to find a suitable material for the rest of the grounds, as I’d decided that it was going to be grass. I considered foam sheets, felt, towelling and microfibre cloths, but they just weren’t doing it for me. On one of my regular wanderings around my local DIY, I came across some textured wallpaper that had a random swirly pattern that I felt would, when painted and dry-brushed, would look suitably ‘grass-like’, so helped myself to a free sample. This was then cut to size to go around the already existing paving, with a slight overlap. However, I forgot that this wasn’t going to be an 11″ square, as one side was longer, so cut the wallpaper too small. So, I had to cut cut the paper in to three sections and use some putty to cover the joins. 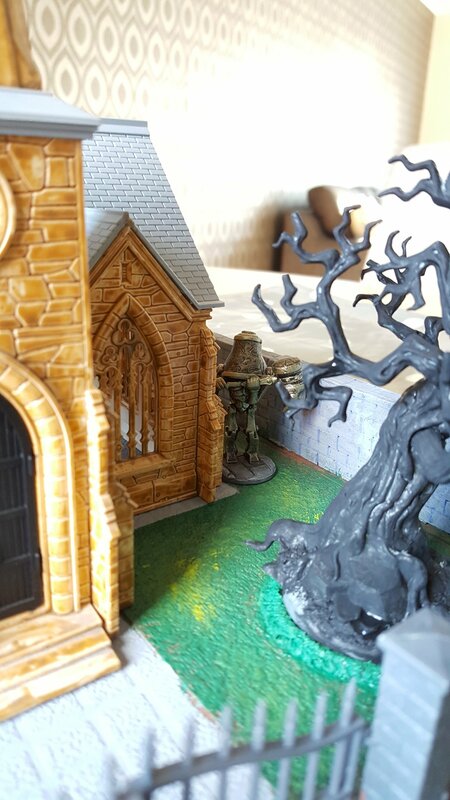 As I wanted the tomb and tree that were going to decorate the front of the churchyard to look as though grass was growing around their bases, I glued two pipe cleaners to the wallpaper in the relevant places, to act as ‘sockets’ for these terrain elements to plug in to. I popped the gates on for the photo, only to discover that I’d glued the columns a teensiest bit too close together, which means the gates overlap by a couple of millimeters. I was initially annoyed, but actually feel that it makes it a bit more realistic, as I’ve seen several wrought iron gates where the settling of the foundations, etc. has shifted the columns so the gates don’t…quite…fit. 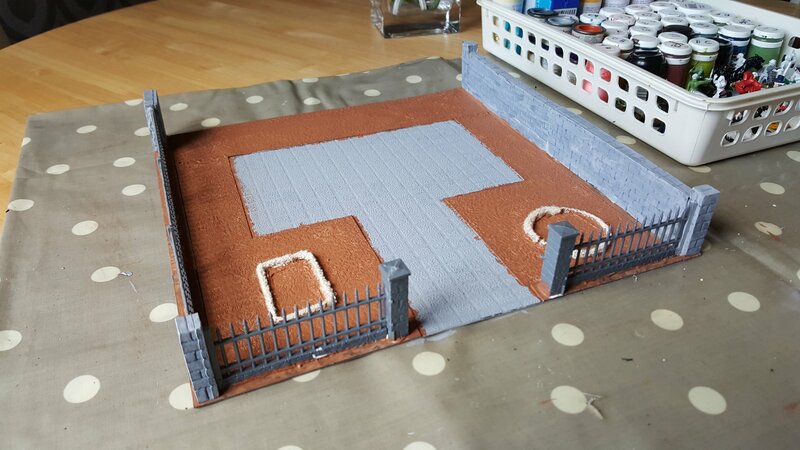 As I wasn’t sure if the foam would take my cheap grey primer without melting and didn’t want to have to repaint my ‘grass’ from a grey undercoat, out came the paints and the paving and brickwork was given a coat of Docrafts Dark Grey (which isn’t very dark at all), whilst the grass was given an initial coat of Docrafts Chocolate Brown. “What? Brown grass? Are you insane?” I hear you cry. Don’t worry though, there is method to my madness, as you will see, but this is what it looked like after the initial undercoats. The next stage was to build up my ‘grass’ on my Chocolate Brown basecoat (representing the mud beneath the grass), by the application of three different shades of Games Workshop green, namely Woodland, Goblin and Bogey. These were put into my mixing tray – a metal tin lid – and using a decorator’s brush, were stippled on to the brown, one after another. The pipecleaner templates were given a thorough soaking of Woodland Green, but I wasn’t able to drybrush these at the same time, as they take bloody ages to dry. Now, ideally, I would have liked to have finished this piece in its entirety, but I had run out of time and my ‘rings’ of grass were still wet. 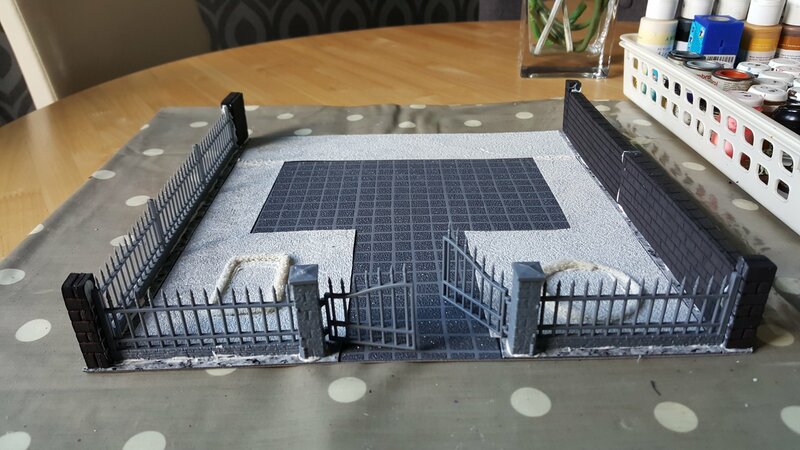 I need to paint all of the brickwork properly and cover up some of the parts where I got a bit messy with my stippling, paint all of the railing black, give the paving a darker grey wash and dry-brush my ‘rings’ with lighter shades of green to make them more grass-like. 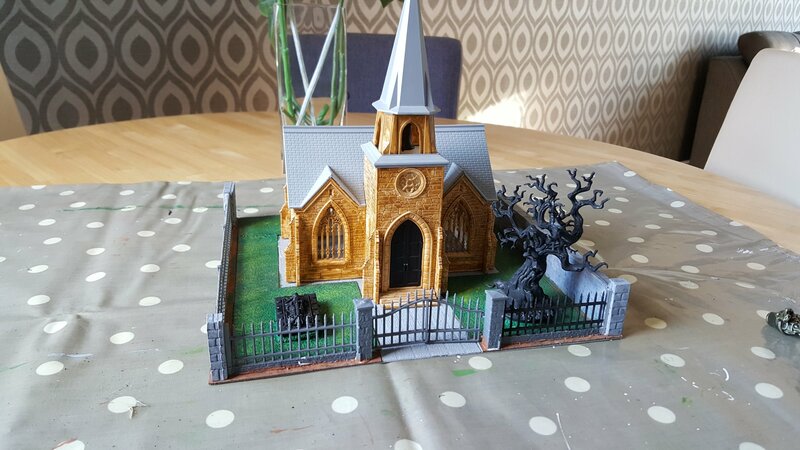 However, to give you all an idea of what the completed tile WILL look like, I thought I’d put the tree, tomb and chapel in place. All three items do need to be completed, but it should give an idea of what I have in mind. 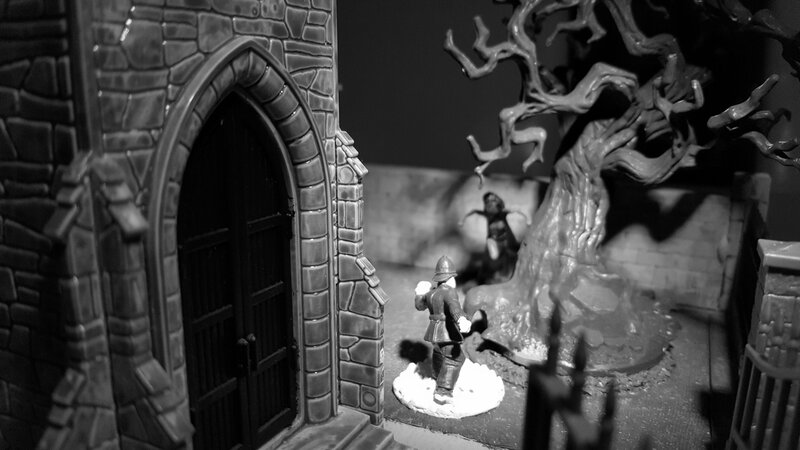 And could that be the mysterious protector of the Chapel of St. Gilbert, hiding in the shadows? That’s all for this week. Next time, MORE ‘Gothic Victoriana’ – might be another build, might be an AAR. Depends on what kind of time I have available during the week.